You would think that after all that has happened with the match-fixing scandal in Italy, the friendly against Russia would be respite, an encouraging preview of what is about to come in a week's time--when Italy, you know, take on that eminently average Iberian team, Spain. The preview was lurid. Italy coach Cesare Prandelli watched his team flounder to a 3-0 loss to Russia, the defeat marking Italy's third consecutive friendly loss. A lot was wrong, and not just Cristian Maggio at right-back, whose blunders were costly. Throughout the game I had the same feeling I have had at different times during the qualifiers, but one that has now swelled into an overwhelming dread: this Italy does not know how to express itself fluently. Indeed, for those eager to rebut the admittedly hackneyed argument that Italy are dour, dogged, and defensive, the statistic that Prandelli's side had the most possession of the ball after Spain during Euro2012 qualifying has been amply useful. But what that statistic does not tell is that Italy have often looked like they don't know what to do when they have the ball. The incisions in the final third have been nibbles around the opposition's goal. When a promising move does actually materialize, no one has been able to capitalize on it for the last 270 minutes or so of football. And so it went yesterday. Prandelli started with Riccardo Montolivo behind Antonio Cassano and Mario Balotelli. Coherent on paper, disjointed on grass. Montolivo was featherweight, ghosting in and out of the game ineffectually, revealing only fleeting moments of competence, while Cassano and Balotelli gave glimpses of their repertoire individually but failed to combine their powers. It was worrying because the two haven't played much together, and it seems like Prandelli will be relying on them significantly. Andrea Pirlo, however, was at his heat-seeking-missile-accurate-best, oxygenating a stifled Azzurri with astoundingly accurate passes in the seventh and twenty-fifth minutes that should have led to goals. But it was the rest of the midfield and defence that will cause Prandelli all sorts of tactical challenges. Even before yesterday's friendly some urged for a three-man defence due to the absence of Domenico Criscito. It would be surprising to see Prandelli switch so late in preparation, but he must somehow provision for better and more cover. Russia approached and breached Italy at will. Maggio was an absolute shambles at the back, while Andrea Barzagli seemed slightly unhinged. Daniele De Rossi and Claudio Marchisio should have provided a bit more cover in midfield as well. Italy conceded only two goals during qualifying but have shipped five in their last three friendlies. While many reached for platitudes in the post-match interviews, Barzagli was the most forthcoming, admitting that Italy "lacked balance." That is perhaps the most dismaying thing for Prandelli to ponder: how to balance this lopsided team. It is all the more dismaying when one casts his mind back to the fall of last year. 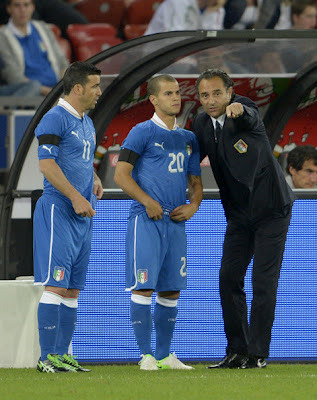 If you recall I wrote an article in September 2011 entitled "Prandelli's Azzurri Show Poise." At the time things looked promising, but the last three friendlies have revealed a somewhat diffident side, unsure of the qualities it took months to cultivate under Prandelli. Prandelli's calibration over the next week will also need to contemplate what role Antonio Di Natale, the veteran at 34, will play this tournament. He came on in the 68th minute yesterday, but his pace and ability to elude marking would have been useful earlier. Di Natale remains a crucial alternative to Cassano or Balotelli. However, he may also get a start if things don't tick after the first game against Spain. More homework for Prandelli then, but the coach was quick to point out (justifiably) that this is also Italy's "third game in eight months," insinuating that the Lega Calcio's obdurate refusal to let him have some time with the players during the season has been a hindrance to the Azzurri. With only a week left until the encounter with Spain, Prandelli has to defy the match-fixing scandal, an injury to Giorgio Chiellini (which should heal in time), Giuseppe Rossi's absence through torn knee ligaments, and the fact that his team only played one of their two scheduled friendlies--the first one against Luxembourg was cancelled because of an earthquake in Italy. On top of that, the country's Prime Minister, Mario Monti, decided to jilt common sense and instead opt for the most drastic non-option available in the wake of the match-fixing scandal. "I wonder if it would be a good idea to postpone Italian football for two or three years," mused Monti. No, Prime Minister. Absolutely not. Even though Prandelli said this week that he would be willing to take Italy out of Euro2012 if need be, Monti's suggestion and Prandelli's willingness though ostensibly noble are a bit bizarre. Despite the predictable furor over the scandal, there remains an aching need for Italy to put in a good account of themselves during Euro2012. There is no time to sulk. There are many things to consider for Prandelli, not least important among which is how his team are actually playing on the field. It is not so much formation that needs tweaking--at any rate, Prandelli was flexible during qualifiers switching between a 4-3-3 and a 4-3-1-2 as required--than a need for incisive eloquence from a team that purports to hold the ball more than we are used to seeing from Italian teams in the past. There will be, after all, no time to stutter against Spain, a team that considers holding the ball their birthright. another great post. I think we're all on tenterhooks when it comes to Italy's match against Spain next week. The fluency that the Italian team is currently lacking, you more than make up for with your eloquent writing. Will be waiting to see your comments in the next coming weeks! Prandelli is trying to hide his modules. The mistakes against Russia were so ridicouls that i had hard time beleiving Azzurri were playing at full speed. On my opinion, he' ll play Balotelli along side two " trequartisti" (choise between Cassano, Giovinco, Diamanti, less hopes for Giaccherini and, why not, DiNatale), using a 4 3 3 formation. Let's just hope to capitalize at best our chances of scoring. Thank you Anonymous 1, 2, and 3. Anonymous1: We are indeed on tenterhooks. I still feel Croatia will be the decisive game, especially given the difficulties they pose for Italy historically. After all, we haven't beaten them since their independence. Anonymous2: It was indeed ridiculous at times. The two trequartisti idea is interesting. I don't think Giaccherini will get much playing time under Prandelli. I think Cassano and Giovinco behind Balotelli is sumptuous on paper. However, a more functional formation may be, like Anonymous3 says, Di Natale and Giovinco. But no way will Prandelli drop Cassano, IMO, so we may well see Di Natale and Cassano at some point.